1. Introduction – Dr Ove Bratland Systems Pte. Ltd. 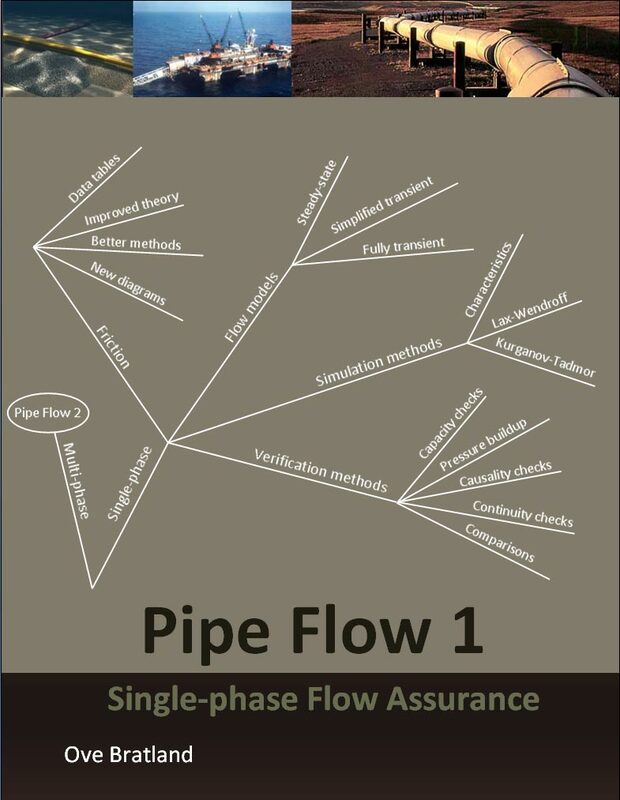 In the first book in this series, Pipe Flow 1 Single-phase Flow Assurance, we observed that dealing with single-phase pipe flow is relatively easy in most cases, and the methods for predicting how the fluid behaves are quite mature. There are still important issues requiring further investigation, for instance related to something as basic as determining a pipeline’s friction and thereby its capacity, and progress certainly continues. But we rarely depend on any groundbreaking new developments in our flow models to perform the calculations required during planning, design, operator training, or operation of single-phase pipelines. 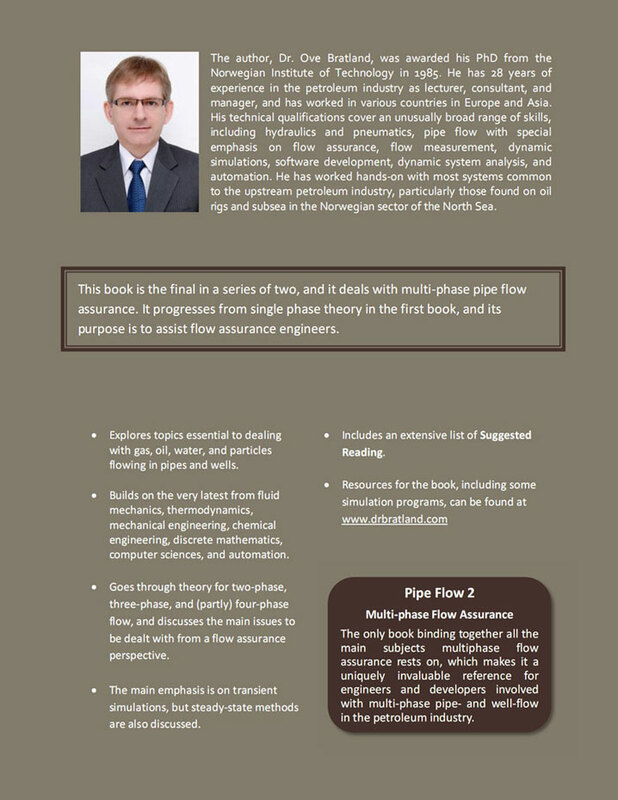 The technology for multi-phase flow is in a very different stage of development. Although multi-phase flow occurs in many industrial processes, methods of transporting multi-phase fluids through pipelines and wells – which is what this book is about – has advanced rapidly in recent decades. Multi-phase petroleum wells have existed for a long time, and multi-phase flow plays an important role in the process industry, the nuclear industry, and many others. In spite of that, calculation methods have traditionally been relatively inaccurate and unreliable, at times balancing somewhere between art and science. Figure 1.1.1. Current and future multiphase gas-condensate flow-lines plotted as function of flow-line length and condensate-gas flow ratio (the gas flow is defined at standard conditions, which is much higher than at actual pressure and temperature). Some of the fields in the diagram also produce water, and the flow in some of the lines is three-phase. The diagram shows clearly that current technology allows further transfer when the liquid content is low. Better flow models are now available, and they are of great help both for predicting production rates, evaluating gas injection alternatives, avoiding problems with buildup of hydrates, wax, asphaltenes, scales, or particles. The models are also used to provide data for corrosion and erosion calculations. The best simulation models are based on cutting edge technology, incorporating very recent knowledge. The latest advancements have benefitted and to a large extent also been driven by the petroleum industry, and it is now possible to transport un-separated gas-oil-water mixtures over quite long distances. This has already had enormous economical impact on some offshore developments, and multiphase flow-lines have in some cases replaced topside offshore installations. That is the case in the Snøhvit- and Ormen Lange-fields off the Norwegian coast, where transport distances are well above 100 km. At Tyrihans, where production was started 2009, the flow-line length is at 43 km relatively moderate in comparison, but the liquid to gas flow-rate ratio is much higher. The Tyrihans flow- line connects a new field to existing offshore structures, saving costs by avoiding new topside structures. At the Con Nam Son-field in Vietnam (outside the range of figure 1.1.1), some processing is done near the wellheads, but only to remove produced water. Sending gas and hydrocarbon liquid together in a 400 km two-phase flow-line to shore saves cost both because local processing is reduced (water separation is cheaper than gas-condensate-water separation) and because one line replaces two by transporting gas and condensate together. Further technology improvements are likely to lead to even greater savings for other fields in the future. In some areas, for instance arctic areas in the north, ice conditions may mean that multi-phase transportation offers not only the most economical option, but even the only one technically feasible. Deep-water fields may also pose prohibitive technical challenges to local separation. Multi-phase flow is often characterized by liquids and gases occurring simultaneously. Sometimes there are also solids in the mix. Strictly speaking all of the flow phenomena surrounding us are multi-phase since no fluid is so clean it does not contain at least microscopic particles. When we want to describe flow, one of the first challenges we face is therefore deciding whether we need a multi-phase model. As an example, consider the earth’s atmosphere. The air contains some water, often in the form of moisture. As long as both air and water are in gas form, the gas-moisture mixture is single-phase and behaves quite similarly to dry air. Properties like density, compressibility, specific heat, and various others are slightly affected by the presence of the moisture, but the equations describing how it flows or how it exchanges heat with its surroundings are not. Describing such a fluid is rather similar to describing dispersed multi-phase flow, for instance small gas bubbles mixed into oil: The gas and oil behave almost like one fluid, and even though dispersed flow is two-phase, a single-phase model can for many purposes approximate it quite well. If air in the atmosphere is cooled down, droplets or ice crystals will sooner or later form, and the flow becomes two- or even three-phase. Meteorologists can deal with that by regarding the fluid as single-phase and average all properties accordingly, or they may use more advanced multi-phase models. Either way, everything becomes more complicated in that they need to consider such questions as where in time and space the droplets or ice crystals form, how they are distributed, how large they are, how the phase shift affects temperature, in addition to various other problems. No model can realistically describe each droplet or snowflake individually, so some sort of averaging is needed to simplify. Theory for how to average has a prominent place in some of the multi-phase literature. When a scientist has constructed a model to the best of his ability, done calculations and interpreted the results, he is faced with one final problem: He must evaluate how reliable the results are. That is also a key requirement when designing a multi-phase flow-line, and it has many flow assurance implications. It is not adequate to embrace the results coming out of a commercial simulation tool without asking any critical questions. The tools currently available are very useful and have user friendly interfaces (Bratland, 2008), but they can usually not produce simple, reliable answers. The reason for this is that both the models and the input data rely on simplifications and approximations. As so often in engineering, it is essential to have a good understanding of the underlying assumptions and mechanisms and to investigate where the greatest uncertainties are likely to be found. Cross-checking the results as far as possible, a much more difficult task in multi-phase than in single-phase flow, is also essential. In the case of meteorology, the undeniable answer will appear as the weather develops, and the models can be frequently updated and tuned to improve results. When dealing with oil and gas developments we are not so fortunate. The first simulations are often carried out years before the pipeline is even laid, at a time when the available input data is quite sparse. At the same time the consequences of inadequate predictions can be very costly and it is certainly possible to end up with a pipeline which cannot do the job it was designed for. Needless to say, it pays to make the best flow assurance efforts possible to minimize the risks. In nuclear reactors, things happen faster than in pipelines (seconds or minutes, as opposed to hours, days, or weeks). This makes explicit numerical solution methods and their correspondingly small time-steps more acceptable in the nuclear than in the petroleum industry. The short reaction times have implications for other aspects of the theory as well. Water is a single-component fluid with well-known properties, and in boilers, it only occurs in two phases. Well-flow, on the other hand, can contain gas, oil, water, as well as sand or other solids, and we therefore sometimes encounter four-phase flow in the petroleum industry. In addition, it is common that the fluid’s composition is poorly known, particularly at early project stages. The pipes’ elevation profiles are very important to how the fluid flows, and they are simple and well known in nuclear reactors. That is often not the case in multi- phase petroleum flows. In the reservoir in figure 1.1.1, the gas is at the top, and the oil further down. The high pressure can lead to some of the gas being dissolved in the oil, and it may start to be released when the pressure is reduced as the oil travels towards the surface via a borehole. To make reasonable flow calculations, we need to predict boiling and the release of gas dissolved in the oil, and these are phenomena to do with chemical properties, pressure, and temperature. Figure 1.1.2. Petroleum reservoir with gas on top and oil below. The pressure reduction experienced when hydrocarbons flow towards the wellhead is partly due to friction and partly due to increased elevation. Gas formation and expansion directly affect both the pressure and temperature. In oil-producing wells we sometimes inject gas via annulus to help the oil rise to the surface. This can improve production rates and prolong the well’s economical lifespan, but it can also lead to less table flow. Some of the challenges involved are discussed later. Keeping in mind that the well may also produce some water and/or particles, the well’s elevation profile may have horizontal or even downhill sections, fluid may flow in at multiple locations, and the fluid composition may change over time, we realize that predicting the flow accurately can be very difficult. Processing facilities are often not located by the wellhead, so the fluid sometimes continues through gathering networks and flow-lines. The pressures and temperatures in these networks can lead to deposits of hydrates, waxes, or other solids, and corrosion or slugging can also cause problems. Sometimes we encounter multi-phase flow in pipelines carrying what was intended to be dry gas, and this can lead to similar problems. In less severe cases it simply results in altered pipe friction or reduced gas quality delivered to the customer, but the flow can also become truly multi-phase. In oil pipelines, the presence of gas bubbles, water, or particles can also make the flow multi-phase. 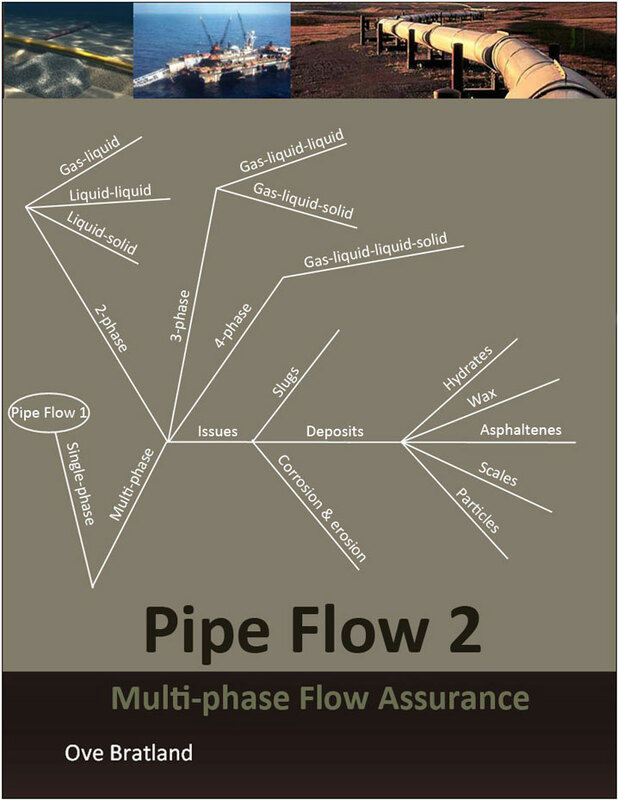 One of the most challenging aspects of dealing with multi-phase flow is the fact that it can take many different forms. In the case of gas-liquid flow, the gas may appear as tiny amounts of small bubbles in the liquid. That kind of flow occurs when there is relatively little gas compared to liquid, at the same time as the liquid flows fast enough to create sufficient turbulence to mix the gas into the liquid faster than the gas can rise to the top of the pipe. Another extreme occurs if tiny amounts of liquid droplets are carried by the gas. In that case part of the liquid becomes deposited on the pipe’s surface and moves as a film in much the same way water moves on the windscreen of a car driving in the rain. Remember that since pressures can be high in pipelines, the gas density is typically much higher that what we are used to experience for air, and even moderate gas velocities can have great impact. Annular droplet flow can be relatively difficult to model accurately since the model needs to incorporate such effects as how fast the droplets are torn from the liquid film, how fast droplets settle on the liquid film, and how the liquid film affects the surface roughness between gas and liquid. In many cases, however, the resulting accuracy is acceptable for our purpose, since this kind of flow does not create the same sorts of problems as slugging does. But it can lead to the various secondary calculations of deposition or corrosion, which use results from the flow models as their input, becoming less accurate. Figure 1.2.1 illustrates the flow regimes we can encounter in horizontal two-phase gas- liquid flow. Stratified flow has the strongest tendency to occur in downhill or horizontal flow with relatively small gas and liquid flow rates. If we increase the gas velocity, waves start to form, and these waves can get high enough to reach the top of the pipe. When that happens, the gas is throttled or even blocked for a moment so that the flow becomes discontinuous, thus leading to the formation of slugs or elongated bubbles. Slugs are generally unwanted because they can create significant pressure fluctuations, and they can also lead to gas and liquid arriving at the processing facilities unevenly, causing tanks to flood. Since gases have lower density and therefore lower heat capacity than liquids, gases cool faster, so the temperature reduction during periods of high gas content can more easily cause hydrates to form. The increased intermittent liquid velocity can also accelerate corrosion. Figure 1.2.1. Gas-liquid flow regimes in horizontal pipes. Slugs forming in horizontal pipes of the sort illustrated on figure 1.2.1 iv) are called hydrodynamic slugs, and tend to be relatively short, typically less than 500 pipe diameters. Another sort of slugs, referred to as terrain generated slugs, form when the pipe’s elevation profile creates local elevation minima. Terrain generated slugs can have periods of several hours, and can originate in both wells and pipelines. Figure 1.2.2. Terrain slug formation. Liquid has a tendency to flow towards the low point and block the gas. The gas pressure builds until the gas reaches the low point and begins to escape into the liquid- filled uphill section. Once that occurs, the liquid column carried by the gas gets shorter and shorter, and it becomes easier for the pressure to push it further upwards. As a result, both the liquid and the gas accelerate out of the pipe. Neither the downhill nor the uphill parts need to be as steep as illustrated here, a degree of elevation can be sufficient for this to happen. It can occur at any low point in the pipe, it does not have to be near the outlet. Risers may create these sorts of slugs if the seabed in front of the riser slopes downwards, and some sorts of risers are shaped like a J or U in order to allow floater movement. The effect of slugging can be reduced by actively controlling the choke at the riser’s outlet. Similar techniques have in some cases succeeded in countering the adverse effect of well slugs by actively controlling the wellhead choke. Figure 1.2.3. Gas-liquid flow regimes in vertical pipes. The flow regimes occurring in vertical are similar to those in horizontal pipes, but one difference being that the there is no lower side of the pipe which the densest fluid ‘prefers’. One of the implications this has is that stratified flow is not possible in vertical pipes. Most of the published measurements have been carried out on horizontal and vertical pipes, which is also what we have shown flow regimes for here. Pipelines generally follow the terrain and most often have other inclinations, so the complexity is often larger than illustrated here. Simulating pipes of any elevation involves determining what kind of flow regime we are facing as well as doing calculations for that particular regime. Flow regime maps of the sort shown in figure 1.2.4 are useful when we want to gain insight into the mechanisms creating the flow regimes. Along the horizontal axis the superficial gas velocity has been plotted. That parameter is more thoroughly defined later, but for now, let us just consider it a way to quantify the volumetric gas flow (or, by multiplying with the density, the gas mass flow). Along the vertical axis we have plotted the superficial liquid velocity. Figure 1.2.4. Example of steady-state flow regime map for a horizontal pipe. We see that for very low superficial gas and liquid velocities the flow is stratified. That is not surprising: As the velocities approach zero, we expect the pipe to act as a long, horizontal tank with liquid at the bottom and gas on top. If we increase the gas velocity, waves start forming on the liquid surface. Due to the friction between gas and liquid, increasing the gas flow will also affect the liquid by dragging it faster towards the outlet and thereby reducing the liquid level. If we continue to increase the gas flow further, the gas turbulence intensifies until it rips liquid from the liquid surface so droplets become entrained in the gas stream, while the previously horizontal surface bends around the inside of the pipe until it covers the whole circumference with a liquid film. The droplets are carried by the gas until they occasionally hit the pipe wall and are deposited back into the liquid film on the wall. We will later learn how to model this process. If the liquid flow is very high, the turbulence will be strong, and any gas tends to be mixed into the liquid as fine bubbles. For somewhat lower liquid flows, the bubbles float towards the top-side of the pipe and cluster. The appropriate mix of gas and liquid can then form Taylor-bubbles, which is the name we sometimes use for the large gas bubbles separating liquid slugs. If the gas flow is constantly kept high enough, slugs will not form because the gas transports the liquid out so rapidly the liquid fraction stays low throughout the entire pipe. It is sometimes possible to take advantage of this and create operational envelopes that define how a pipeline should be operated, typically defining the minimum gas rate for slug-free flow. Similar flow regime maps can be drawn for vertical pipes and pipes with uphill or downhill inclinations. Notice that even though numerous measured and theoretically estimated such maps are published in literature, and although they can be made dimensionless under certain conditions (Taitel & Dukler, 1976), no one has succeeded in drawing any general maps valid for all diameters, inclinations and fluid properties. Therefore a diagram valid for one particular situation (one point in one pipeline with one set of fluid data) is of little help when determining the flow regime for any other data set. That is why we need more general flow regime criteria rather than measured flow regime maps. Characterizing flow regimes from visual observations in the laboratory is complicated as well, and the transitions are difficult to define accurately. To make matters worse, the flow regimes in figures 1.2.1 and 1.2.3 are not the only ones one may include when defining horizontal and vertical gas-liquid flow. Different researchers define different number of flow regimes during laboratory categorization, and the number of regimes implemented in simulations models is sometimes kept lower for simplicity. The flow regime selection shown here constitute therefore only one example of how they may be defined. Predicting the flow regime can be the least accurate part of multi-phase flow calculations. Another difficulty comes from the fact that measurements, which are most abundant for small diameter pipes, are hard to scale up to larger diameters. This problem effects both flow regime determination and the modeling of each specific regime. Sometimes we must deal with multi-phase flow in annular cross-sections. The phenomena and flow regimes encountered in such cases are principally the same as in pipes, but as explained in Pipe Flow 1, the frictions tend to be higher. The flow regime changes happen under somewhat different superficial velocities in annular compared to normal pipe flow. Two-phase flow can also occur when the pipe carries two liquids – oil and water, for instance – rather than a gas and a liquid. Liquids tend to have more similar density, and as chapter 13 will reveal, liquid-liquid flow can result in more flow regimes than those mentioned so far. Figure 1.2.5 a) and b). Various annular flow regimes in wellbores. a) Upward flow, concentric annulus and b) eccentric annulus. Three phase flow is most often encountered as a mixture of gas, oil and water. The presence of sand or other particles can result in four-phase flow, or we may have three- phase flow with solids instead of one of the other phases. Although sand has the potential to build up and affect the flow or even block it, the most common situation if sand is present is that the amounts are tiny. If we keep the velocities high enough, the sand is quickly transported out of the system, and we can often get away with neglecting the particles in the flow model. Instead, it is only taken into account in considerations to do with erosion or to establish minimum flow limits to avoid sand buildup. The three-phase flow our simulation models have to deal with are therefore primarily of the gas-liquid-liquid sort, and sand is only included – if at all – indirectly. Creating flow regime illustrations similar to those for gas-liquid flow in figures 1.2.1, 1.2.3, and 1.2.4 is very difficult for three-phase flow. Some authors have done so, but they end up with very complex illustrations of limited validity, and the pedagogical value is questionable. It may be more convenient to illustrate three-phase flow as shown in figure 1.3.1. The diagram has been plotted in three dimensions, one for each phase. The vertical axis contains the gas superficial velocity as a fraction of the total superficial velocities. That superficial velocity fraction has been defined so that it becomes 1 for pure gas flow. For pure liquid (oil-water) flow, which corresponds to a straight line in the oil-water plane, the gas fraction is zero. Similarly, if the water content is zero, our operation point will be located somewhere on a line in the gas-oil plane, and so on for zero oil content. Operation points inside the triangle will correspond to three-phase flow. The zero oil and zero water content planes in figure 1.3.1 correspond to gas-liquid flow regimes similar to those discussed in chapter 1.2. In the oil-water plane, the liquid- liquid mixture can show a very interesting property we have not mentioned yet: The oil can occur as isolated droplets dispersed in the continuous water. If we increase the oil content, the flow can suddenly switch to the opposite situation in a process called phase inversion. The dispersion’s viscosity tends to be quite similar to the continuous phase’s viscosity, which normally is much higher for oil than for water. Whether we have an oil-in-water or water-in-oil dispersion is therefore very important to the mixture’s viscosity, and we can observe significant viscosity ‘jumps’ when a phase inversion occurs. If we take a look at the modified Moody diagram, we see that the consequences of using inaccurate viscosity (and thereby inaccurate Reynolds number) in the friction calculations depend on where in the diagram our operational point is located – for relatively high Reynolds numbers and/or high surface roughness, it may have little or no influence. Figure 1.3.1. Three-phase gas-oil-water diagram for horizontal pipes. The illustrations along the borders show some (though not all) of the two-phase flow regimes possible for gas-oil (left border), gas-water (right border), and oil-water (lower border) flow. When all phases are present simultaneously, many more different flow regimes become possible. We can also experience other liquid-liquid flow regimes, and the number of possible regimes becomes very large when we move upwards in the three-phase diagram. As a general rule, it is likely the liquids appear as one dispersed in the other if they occur in very different quantities. In some cases we can get reasonable results by treating the two liquids as one averaged liquid and reduce the problem to two-phase gas-liquid flow. Some of the commercial software treats three-phase gas-liquid-liquid flow in this way in all situations, but it can lead to quite inaccurate results for some flow regimes. Slugs: The challenge is to avoid, minimize, or design the system so that we can live with slugs. Hydrates: Hydrates are ice-like structures which tend to form if the temperature falls below a certain value when gas molecules are in contact with water. We try to avoid steady-state hydrate formation (hydrates forming under normal circumstances) by injecting inhibitors, using thermo-insulation or even heating. We also attempt to optimize cooldown-times, allowing us sufficient time to take action in case of shutdown, but without increasing costs more than necessary. Achieving acceptable hydrate avoidance conditions at a minimum cost usually includes simulating the known or presumed fluid composition for various alternative anti-hydrate strategies and ranking the results. The solution must be flexible enough to be able to deal with uncertainties, and remediation methods in case of blockages are also normally considered. Wax: Depending on the fluid’s composition, paraffins in the oil can create challenges similar as for hydrates, the difference being that we may accept steady-state buildup and simply choose a high enough pigging frequency to scrape out built-up wax before the layer becomes thick enough to create problems. Asphaltenes: This is also quite similar to dealing with hydrates or wax, but chemical properties making it a problem is encountered somewhat less frequently. Scales: Scale deposits differ from the others mentioned above in that they are inorganic, come from produced water, and tend to be harder. Like the others, though, they can be prevented or removed by inhibitors and pigging. Chemicals can also be used to remove scales. Corrosion and erosion: External corrosion is almost always of concern to steel pipelines, but it is beyond the scope of this book. Depending on what the pipe transports, internal corrosion is frequently also a concern. The chemistry involved in corrosion is very complex, and it remains a rapidly developing field. Corrosion is strongly affected by temperature, pressure, and velocity, and corrosion models can take such data from the flow models and use them as input. Pure erosion is usually not a problem in petroleum pipelines, but erosion in combination with corrosion can enhance each other to produce more damage than they would separately. For the most part this book follows the definitions laid down in the first book, Pipe Flow 1. Multiphase flow also calls for additional definitions, some because they improve clarity, while others have become popular for less obvious reasons. This book tries to avoid jargon deemed to be of the second sort, but with some exceptions for terminology essential to understanding other relevant publications. When we have multiple phases passing through a cross-section of the pipe, each phase can obviously not cover more than a fraction of the area. If, for instance, a fourth of the cross-section is occupied by gas, we say the gas area fraction (or the volume fraction, since volume corresponds to area if the length of that volume is infinitely small) or simply the gas fraction 0.25. If the remaining area is occupied by liquid, the liquid fraction has to be 1 – 0.25 = 0.75. Some authors choose to use a different name for liquid fraction and call it liquid holdup or simply holdup, while sticking to the fraction-terminology in case the fluid is a gas. The term water cut is also used occasionally, particularly in describing a well’s production. It means the ratio of water volumetric flow compared to the total volumetric liquid flow. Gas – if there is any – is not taken into account in this definition. Note that water cut does not in itself describe how much water there are in the liquid, since water and the other liquid(s) may flow at different velocities. Water cut refers to production rate fraction, not volume fraction. In single-phase flow, we often define instantaneous average velocity (the average velocity at a particular point in time) as volumetric flow Q [m3/s] divided by pipe cross- sectional area A [m2]. That way, the average velocity directly reflects the volumetric flow. We see that the superficial velocity is proportional to the volumetric flow, and it can be regarded as the average instantaneous velocity the phase would have had if it occupied the whole cross-sectional area of the pipe. Since it often occupies only part of it, the superficial velocity tends to be lower than the actual average velocity. Other mixture properties or quantities can be defined in a similar fashion. In this book, pipe is used with a broad meaning and includes what some authors may call channel, duct, conduit, tube, wellbore, line, riser, or hose. We sometimes also use flow-line or gathering network to emphasize that we are referring to the pipe(s) transporting produced gas/oil/water/sand from one or several wellhead(s) to the processing facility. The multitude of names used to express pipe is worth keeping in mind when searching for related literature – the term ‘vertical pipe slug’, say, may not turn up in certain articles, even if ‘vertical duct slug’ does.